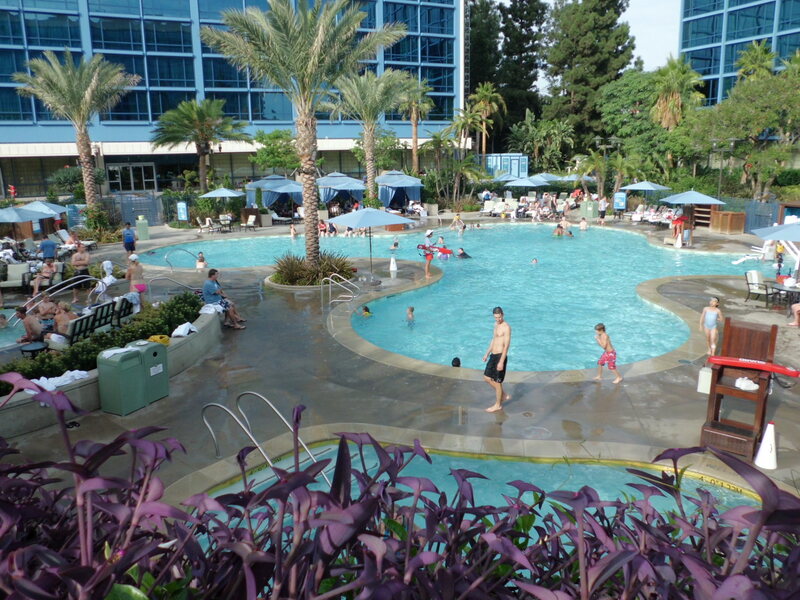 This is part 2 of a 3-part series on the Hotel Pools of Disneyland. Click here for Part 1; Stay tuned for part 3. While my favorite Disneyland hotel may be the Grand Californian, my kids would tell you they think the best Disneyland pool is the one at the Disneyland Hotel. The pool is pretty spectacular, particularly for older kids—8 and up. 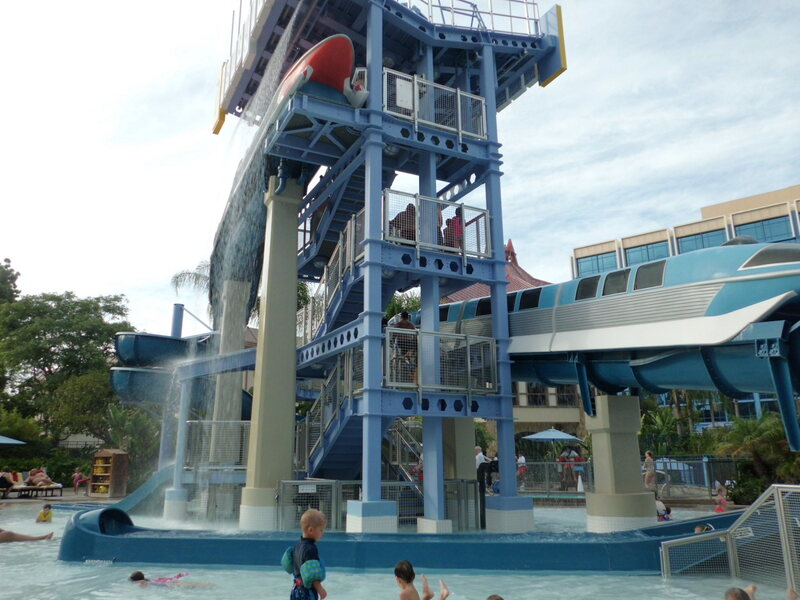 The little ones love it too, but they would probably be perfectly content to swim at the Grand Californian as well. My college age-niece and nephew loved this pool best too, so I think it’s perfect for all ages. It’s the largest and newest pool complex of the three properties at Disneyland. The showcase water slide makes an exciting statement. While at the Grand Californian you can almost pretend you’re in a mountain oasis, here there is no mistaking where you are–poolside at the happiest place on earth. 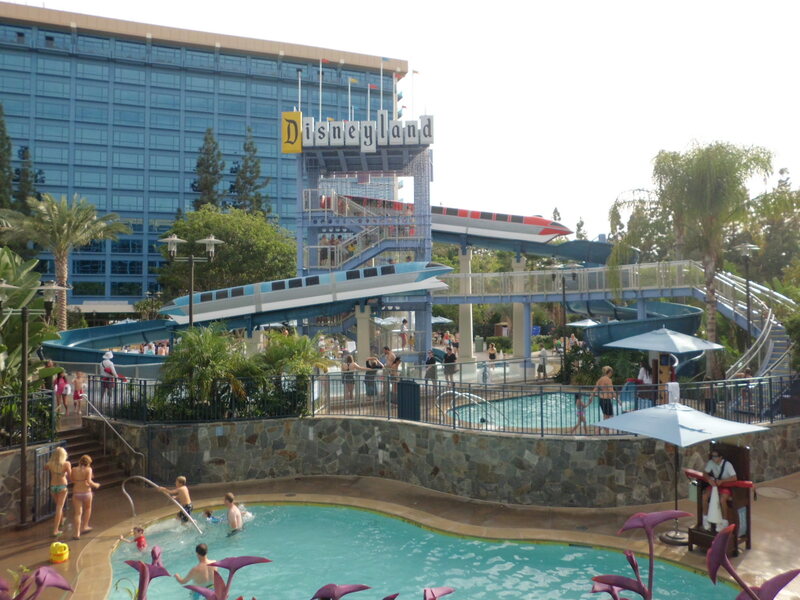 They reopened the pool earlier this year (2012), with the Monorail Slide Pool sporting a re-creation of the original Disneyland Park entrance sign, two waterslides and a water play area. It’s big, it’s dramatic and it’s like no other waterslide my kids had seen before. There’s also the “E” Ticket Pool, with actual replica E Tickets embedded in the tiles along the waterline—a nice touch. The “D” Ticket Pool is calmer and more peaceful, with a bridge overhead and some actual yardage to transverse. There are plenty of rentable cabanas here too (more than at the other properties) as well as Mickey- and Minnie-themed hot tubs. 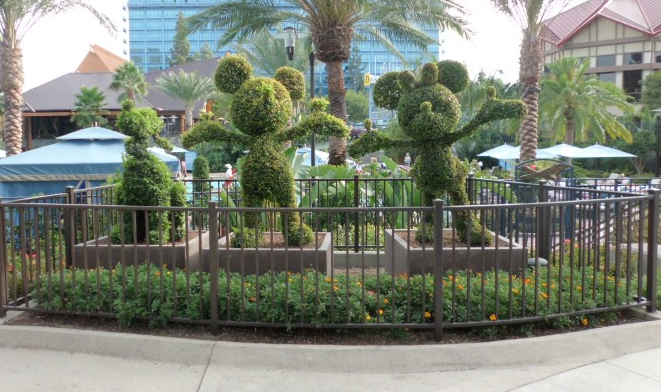 I love the topiary entrance to the pool area featuring Mikckey, Minnie, and Goofy in their leafy glory. Knowing that the hotel has been here in some form since the 1950s, and the attention to heritage, gives the place a historical feel not at the other hotels. If it’s your first time staying at the parks, or you are a big Disney fan, you’d probably love the Disneyland Hotel. They’ve recently updated the rooms too, with some suites featuring ultra cool Disney surprises and magic touches. If you’re looking for a pool experience that takes you away from all that Disney, I’d look at one of the other two options (or even consider staying at a nearby hotel). But if you want to be poolside at Disneyland and still feel like you’re at Disneyland, you won’t go wrong here.